Home :: Products :: Services :: Completed Projects :: Careers :: Why Pyro-Comm Systems? Pyro-Comm Systems provides a variety of low voltage services to California businesses, government agencies, contractors, and building owners. All of our technicians are trained and qualified to do the work at hand. Whether you are looking for a new Fire Alarm System, Security System, Gas Detection System, Healthcare Communication System, or other low voltage system, we have the solution and expertise to fit your specific needs. Our Sales-Engineers are trained to understand the Code requirements for each type of occupancy and are more than qualified to give you a price-competitive quote. We have 30+ years of experience in all market applications that include buildings from a single restaurant to intricate high-rise Fire Life/Safety systems. Let Pyro-Comm Systems give you a quote today. Pyro-Comm Systems, Inc. specializes in Fire Alarm System Testing in accordance with NFPA 72, Underwriters Laboratories and local Fire Department requirements. Pyro-Comm System's technicians are California State certified and factory trained to test and service your Fire/Life Safety System. Pyro-Comm Systems provides a tailored testing program to fit the needs of your building to minimize interruptions in your daily business. While providing excellent customer support, the Pyro-Comm Team enjoys developing long term and mutually beneficial business relationships built on trust, accountability and delivery. Contact us for a complete evaluation, service proposal and custom service plan based on current codes, individual customer needs and fire alarm system requirements. We look forward to the opportunity to meet with you and discuss how Pyro-Comm System's service can help you achieve your fire/life safety management goals. If your system is impaired or it has a TROUBLE light on, our Service Department technicians can determine the cause and provide a corrective solution to fix the system. Our service technicians are State of California certified and factory trained to diagnose, troubleshoot, and repair systems so they can continue to operate at their peak efficiency for years to come. We have service technicians available 24 hours a day, 7 days a week to make sure that whenever your system has an issue, we will be able to respond to your needs. We are an Underwriters Laboratories certified service center with 3 offices. Call Pyro-Comm Systems today to fix your system. Who is off-site monitoring your system? 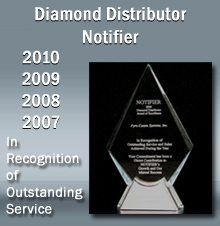 Pyro-Comm Systems is an Underwriters Laboratories listed and certified testing, service, and installation company. We utilize an Underwriters Laboratories listed and certified Central Station Monitoring Facility for off-site monitoring. We can monitor your system over dedicated phone lines, IP (Internet Protocol), or Cellular-GSM (Global System for Mobile Communications). Our monitoring station has UL inspected and approved backup power systems, and redundant receiving stations to ensure 100% up-time and continuous monitoring of your system. If you can't say that about your current monitoring company, then you should contact us to set your system up with the best monitoring available. If your system is not operational, it is possible to replace the system under an “emergency repair” project where approved by the fire department; the system is replaced on a one-for-one basis and your building would again be protecting your building occupants. Pyro-Comm Systems is experienced in retrofitting systems from a small commercial building to high-rise hotel systems, and we can upgrade or replace your system to protect you and your property. Contact Pyro-Comm Systems and we will give you peace of mind within a budget you can afford. If you are a building owner or property management company and have tenants moving in, your system needs to be modified to meet current Code requirements for that tenant space. Whether it is a small office addition or a tenant that is taking over multiple levels, we can accommodate the addition to your system. Pyro-Comm Systems has a dedicated Tenant Improvement group that can take care of all your system addition needs. We can come out to your building and safe-off the devices before the construction phase of the new tenant, and come back to install any new devices needed for that area. Let us prove to you that we are the best in the business today by contacting Pyro-Comm Systems for your system addition. Systems that are designed and working properly can save lives, property, and insurance premiums. Our Code Consulting staff is NICET (National Institute for Certification in Engineering Technologies - www.nicet.org) certified engineers, and factory trained and certified technicians for proper system design and integration. We can help you design your system to meet current Codes and requirements of the local and national jurisdictions. We are experts at assisting you with your project specifications, drawings, and approvals for a system that will be able to accommodate any size building or occupancy type. Contact Pyro-Comm Systems today to ensure your system is done correctly. Pyro-Comm Systems has completed projects throughout California. 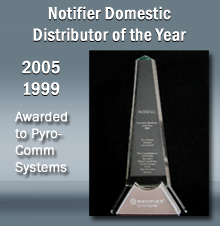 During the last four consecutive years, Pyro-Comm has received awards for outstanding services from Notifier by Honeywell.